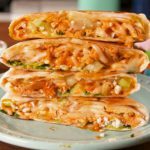 Cheesy Keto Chicken Quesadillas are super easy to make and are perfect if you’re in need of a keto or low carb chicken recipe on any occasions! In a medium-sized bowl, whisk all ingredients together until the batter begins to thicken. Allow to sit for 10 minutes, batter will thicken even more. Grease a skillet with non-stick cooking spray over medium heat. Pour 1/4 cup of mixture into the skillet and quickly swirl the batter to create a thin circle. Cook on each side, about two minutes. Allow to cool on a plate, set aside. Place a large skillet over medium heat. Place one of the tortillas in the skillet and sprinkle with cheese. Once cheese begins to melt, add shredded chicken, cilantro and scallions. Sprinkle more cheese over the chicken and add another tortilla on top. Flip the quesadilla to warm the other tortilla. Once cheese is melted, remove from skillet and enjoy.